Beautiful home!!! Good location. Host was great at communicating and even checked in with us. Much better than other places we have stayed. Lots of space on a quiet cul-de-sac. We had a wonderful time with our adult children in this spacious home. The basement was a perfect spot for the kids and they loved the hot tub! Had a wonderful time. We booked last minute and received a very prompt response. The house was wonderful and had everything we needed and more. The kids loved the games and toys that were there! Great location! Very easy check in process, less than 5 minutes (off-site location). Direction to complex easy and on-site underground parking is a huge convienance. Unit is in good condition and as listed. Kitchen has most items needed and could use additional glasses and dishes for a party of 6-8. Amenities such as pool, hot tubs, sauna, steamroom, etc were clean and enjoyable. Very short walks to many good restaurants, shops and ski lift. Unit is quiet with some views of surrounding mountains. Check out easy and would stay again. Mountain Lovers. Big Timber Lodge was perfect! It was the most spacious and cleanest vacation home we have ever rented. The kitchen was amazingly well-equipped. The proximity to town was perfect. 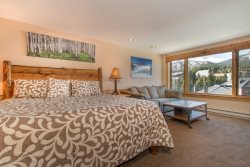 The location was perfect - close to Main Street and all the excitement of Breckenridge. The host was very accommodating - reaching out to us before arrival and making sure we knew where to pick up keys, etc. the accommodations were great - lots of room to visit and plenty of sleeping room for our little family reunion! It was a beautiful place. Very nice hot tub. Comfortable beds. The parking was pretty tight, but it ended up working out. We stayed at the Summit Peaks South Cabin and it was absolutely perfect! There was up to 15 of us at one point and there were enough beds/space to fit the entire family! Everyone had their own bed, some shared a room, and we all had clean sheets/towels. The kitchen was very up to date and decent size filled with all the amenities you needed. The front porch had a hammock and the back deck had a grill/jacuzzi. I am an early riser so I went walking every morning and right near the house there was hiking trails you could go on, very safe. We went in June so the days were hot and the nights were cold so be prepared to bring layers! The town was only a 5 minute drive down the mountain and there were shopping outlets for everyone's convenience. The house does have another unit connected "North Lodge" but we never heard our neighbors. Be cautious of how many cars you bring bc both units need to share the driveway. We were lucky enough to not have neighbors until the very last 2 days. We had a great time and the place was wonderful! Communication was great and key pick up and drop off was easy. Great place to stay in a great location too. We could walk to downtown Brick within a min. Place was just as described. Host was awesome as well!! We scheduled a last minute trip to Breckenridge, and we were able to complete the reservation, and make contact in great time. We thoroughly enjoyed our stay. Loved the house and the hospitality was great! Very clean and tidy. The room was great and it was a convenient location despite that part of the Mtn having closed lifts. Great! Perfect location and clean space. Very clear Lots of communication Love the location. No complaints. Pre-visit and post check-in calls were appreciated. Written communication was very helpful. Good location by peak 8. Had a nice time with the family skiing and snowboarding - nice house. We really enjoyed our stay at this townhome! The layout of the home was perfect. It gave everyone enough space. Those who hit the slopes loved how close all the slopes were to ski/snowboard. Also, the shopping was great!! We will definitely stay at this place again!! Clean and spacious. Our stay in this condo was very nice. There is plenty of room and very clean. We really enjoyed being so close to the lifts and downtown. The house is beautiful and extremely well situated. We spent a week with family (10 guests!) and the space was perfect. Everything worked as expected. We could Ski in and Ski out. Everyone enjoyed very much the house, the jacuzzi, barbecue, tv room, deck, etc... Great Experience overall. Fantastic house with all you need to be at home. Place was perfect for our group. Easy access for check in and check out. Everything in walking distance. Would definitely stay there again next trip. We rented the condo at the last minute when we decided to make a quick trip to Breckendridge for the long weekend. Our two children took classes at the ski school and the location of this condo was so perfect! We walked literally a matter of steps to the ski school, dropped off the kids, and then walked steps to the lift to head up Peak 9 for the day. Absolutely cannot find a better location. Even though the kitchen was fully stocked with utensils and cooking would have been easy, we chose to walk to dinner each night and there were plenty of restaurants within walking distance. The one night we chose to go further into town, the staff at the Village Hotel was nice enough to arrange a shuttle ride there and back. The condo is very nice and very clean. Would stay here again for sure!